May 28, 2012 -- An Old Lyme tradition resumed again today under sunny skies, a welcome contrast to the drenching rains that caused the cancellation of the 2011 event. Parade participants marched in front of cheering crowds from the firehouse on Lyme Street to the parade terminus at Duck Creek Cemetery. The closing ceremonies incuded, among other things, performances by the Lyme Old Lyme High School Marching Band, essay readings, a flag ceremony, and a 21 gun salute followed by Taps. I posted photos of this event right after Memorial Day and LymeLine.com ran some of them when they were fresh and new! This annual event is one of my family's favorite aspects of living in small-town Connecticut. There is a real sense of community as we see people we know from school, gymnastics, and little league scattered up and down Lyme Street. The whole town seems to be involved in the parade. Everyone first meets at the parade staging area as many families have kids marching with a band, baseball team, scout troop, etc. Then the parade rolls by, kids throwing candy, other kids scrambling to pick up candy, parents and spectators waving and snapping pictures. Then, the whole town gets up and follows the parade down to the cemetery for the Memorial Day ceremony. Afterwards, the parade sort of reverses course and we all follow the marching bands back to the firehouse where the whole event started! After enjoying free hot dogs and soda on the apparatus floor of the firehouse, residents are welcome to wander down to the Lyme Academy for the antique car show and an impressive array of sparkling automobiles. LOLMS Marching Band - Anchors Away, played 100 times! See you next Memorial Day! 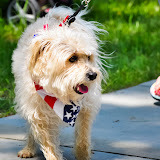 Categories: "Band", "Classic Cars", "Connecticut", "Event", "Holiday", "Local Flavor", "Memorial Day", "Old Lyme", "Parade"